1. 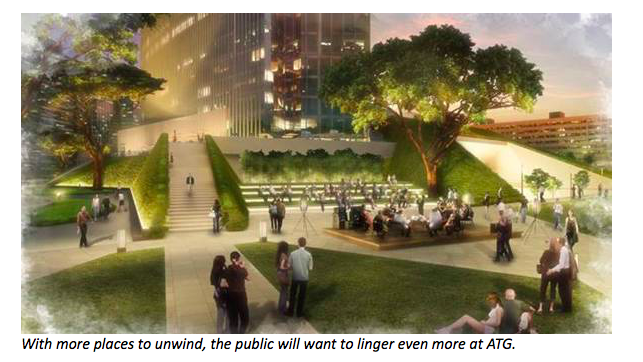 What is being developed in Ayala Triangle Gardens? 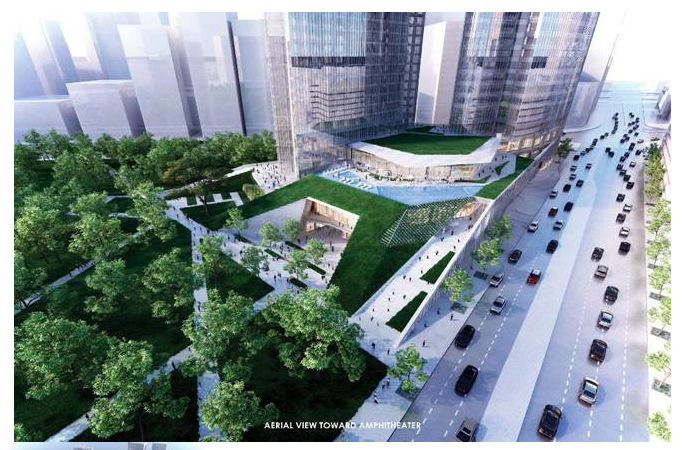 Ayala Land is currently developing the northern tip of Ayala Triangle Gardens to make way for Tower 2, a high grade office tower with 38 floors, the 5-star Mandarin hotel with 22 floors, and a retail podium that will connect the two towers. Equally important to the towers, we will build new civic spaces that will expand the gardens and enhance the experience of the public. 2. What other improvements will we see? We carefully planned the development to make sure that the open spaces are integrated to the buildings to create more enjoyable experiences for everyone. With the gardens expanded, there will be new gathering places for different events and activities. 3. How will the retail podium be different from the malls and other commercial establishments around the city? We envision the small retail podium to have a variety of offerings catering to the general public. With easily accessible and affordable dining, the office workers will be able to enjoy this extension to the currently well-loved Restaurants at Ayala Triangle Garden. This will encourage more visitors during the weekend so we will ensure that the offerings will also cater to families living around the city. 4. How much open space will be left after the development? 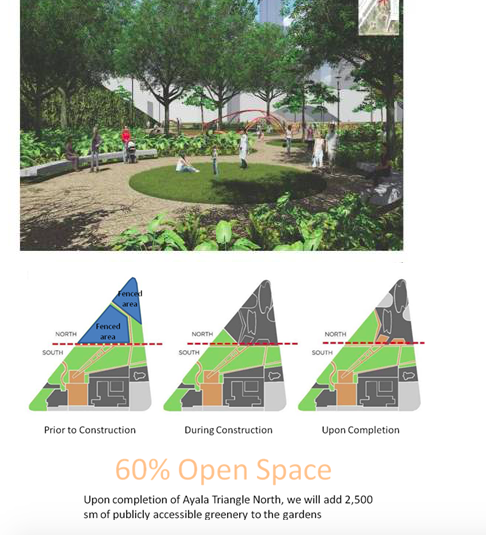 We masterplanned Ayala Triangle Gardens to leave 60% as open spaces for the public to use and enjoy. 5. If 60% of the gardens will remain open after the development, why is the area boarded-up big? 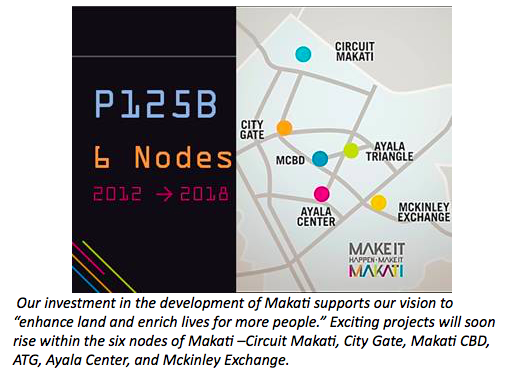 The board-ups cover 1.8 hectares of the 7-hectare Ayala Triangle Gardens but the footprint of the buildings will only be 1.1 hectares. The boarded up area is big to give enough space between the construction and the flow of pedestrians since we give high importance in ensuring the safety of the public. In addition, we need space for the staging area when we construct the basement parking. 6. Will there be sufficient parking available when the development is finished? We will have sufficient parking spread across 6 basement levels. 7. What will happen to the trees? All 71 affected trees have been replanted—60% within ATG and 40% in Circuit Makati. To ensure careful management of the existing landscape, we are working with Joseph Server and Associates, Inc. which is a team of full time foresters and horticulturists dedicated to tree care and who are familiar with the latest best practices for tree management. 8. 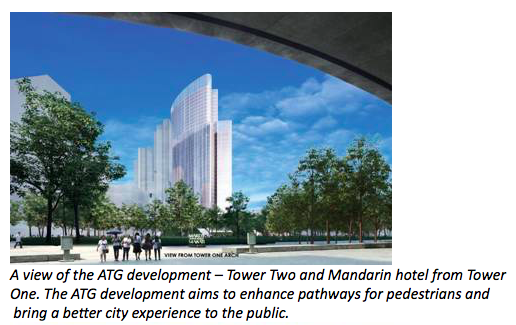 What’s going to happen in ATG during construction? Will it remain accessible to everyone? ATG will remain open to the public so you can still do your daily activities. Additionally, there will be no disruptions to traffic and no road closures. 9. How long will construction be? Since we are building two towers, the construction will take 5 years to finish. The development will be available to the public by 2020.